What did I just say? 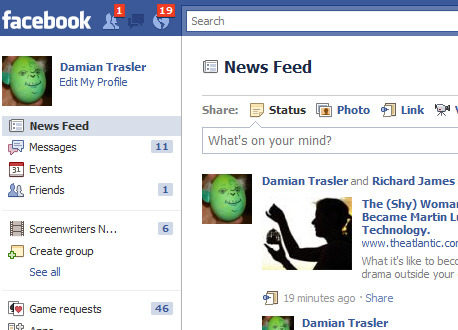 | Damian Trasler's Secret Blog - Do Not Read! ← All the latest from Lazy Bee Scripts! It reached us via the status bars of a few friends and we reposted it, wanted to join the legion of super-cool folks, but also agreeing with the sentiment behind the words. Seeing the baying mob outside the White House was disturbing, and we wanted to add our voices to the people saying “He was bad, he was wrong, I’m glad he won’t be influencing any more people (directly, though I’m sure his voice will be used by others) but this carnival over his death isn’t right.” You know what it reminded me of? The guys who danced in the streets burning American flags after 9/11. So folks, two points to take away today: The power of well written words, for one. Jessica Dovey thought about her reaction to the death of Osama bin Laden and wrote something simple but heartfelt. I bet she worked hard on those words before pressing that button. Secondly, the power of Social Media. Her friends liked what they read (and okay, maybe they misunderstood where it came from, but I think they’d have taken it up all the same) and they sent it on….and it travelled around the world. JK Rowling became an international sensation with a series of books. Jessica Dovey became a worldwide sensation with a sentence. Have YOU unintentionally misquoted someone? Who corrected you? Do you have to put people straight when they get a quote wrong? Or better yet, have you said something on Social Media that you later saw reposted by someone you don’t know? This entry was posted in Uncategorized and tagged Damian Trasler, Jessica Dovey, JK Rowling, MLK jr, Osama bin Laden, quotes, Richard James. Bookmark the permalink. I saw that status too. I’m glad the real writer of it got credit back. I agree with her sentiments exactly. I am glad he is gone and do no more harm. But I can’t celebrate all the catchy death slogans and media excuses to use bad language on the front of newspapers. None of that helps us heal in my opinion. “An eye for an eye leaves the whole world blind.” And that IS Martin Luther King Jr. Thanks Jess, particularly for the quote – it’s a good one I haven’t heard for a long time. Repeat – the POWER of social media. I can’t believe how fast word spreads….I was in awe of all the tweets Sunday night, then flipped over to FB and it was just as busy. So much for the media…maybe we can finally shut them up this way. Enjoyed your post, D – have a great vaca! I loved the fact that the operation itself appeared on Twitter, albeit as a noise complaint by a local resident (who then went on to become an internet celebrity.) People power…. I really had not heard of Jessica Dovey til I read this. I’ve been avoiding the whole bin Laden thing. I’m conflicted to be honest. I’m glad his threat is gone but I don’t think celebrations are appropriate either. As for misquoting, I’ve done it but not online. I try to correct myself and if necessary apologize. If it ever happens online I’ll do the same. I hate extremely long status updates. I don’t want to read someone’s biography, I just want to read something witty or interesting. I don’t mind quotes, but sometimes that’s all people post everyday. I’m fond of updating my food status! Facebook has changed EVERYTHING, for good or ill, I don’t know.